One of our favorite Ruger bolt-action rifles is now available in a caliber better suited for varmint hunting. The versatile Ruger Gunsite Scout Rifle, previously offered in .308 Winchester only, is now chambered in .223 Rem / 5.56 NATO. This newest version of the Gunsite Scout Rifle features a hybrid chamber that shoots both 5.56x45mm NATO and .223 Remington. This rifle is light and compact. With a 16.1″ barrel, it weighs just 7.1 pounds without optics. The .223 Scout Rifle is offered in both right- and left-hand versions, both with a 10-round detachable box magazine. You can choose either an all-stainless version ($1099.00 MSRP), with SS receiver and SS barrel, or a dark version ($1039.00 MSRP) with matte black alloy steel action and barrel. The bolt offers Mauser-style controlled round feed, with a lever-style safety on the rear of the bolt shroud. The rifle features a 16.1″, 1:8″-twist rate, barrel fitted with flash hider which can be removed to attach other 1/2-28 threaded barrel accessories. Interestingly, the magazine for .223/5.56 Scout Rifle is dimensionally the same as the mag for the .308 Scout Rifle. The .223/5.56 mag employs a plastic insert to feed the smaller cartridge properly. The black laminate stock is fitted with sling swivel studs and features checkered grip and forearm. A soft rubber recoil pad with three 1/2″ spacers allows the length of pull (LOP) to be adjusted. Ruger Scout Rifles feature a Mini-14-style protected, non-glare, post front sight and receiver-mounted, adjustable, ghost ring rear sight. The forward-mounted Picatinny rail lets you use a variety of optics including LER scout scopes that allow “both eyes open” target acquisition. Ruger provides scope rings for mounting conventional scopes on the integral M77-style mounts built into the Scout Rifle receivers. 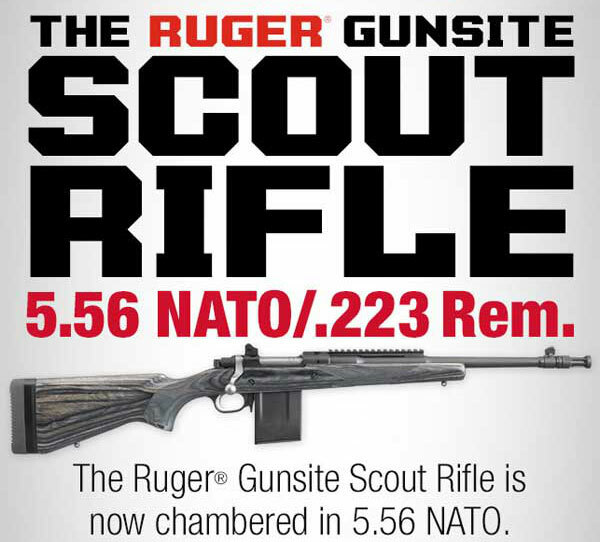 Share the post "Ruger Gunsite Scout Rifle Now Available In .223 Rem / 5.56 NATO"
so close but so far. why not use AR or even Mini-14 mags? nah lets find a totally random proprietary mag manufacture that charges $70 for a 10 round mag. The only size you can get. ??? One possible answer for not using AR mags is to simplify production. Keeping the same size magazine for 308 and .223 allows you to reduce inventory on stocks, triggers, and possibly other things. The action and barrel would be the major changes to the platform. Ruger is known for smart design and utilizing parts from prior models to streamline production and reduce inventory. MAGAZINES: Ruger Guide Guns come with the Accuracy International standard metal 308 magazine. It is not a proprietary magazine. Ruger 308 magazines are $30 apiece and are made of polymer. They come in 3, 5, and 10 round sizes. Something similar will be done for the .223/5.56 as well. Please don’t fear-monger or bash without doing your homework. Personally, I think the plastic insert (with a taper like 1911 mag wells) should’ve gone inside the magazine well so that standard AR mags could be utilized. That makes the Mossberg look a bit better to me. Should use Mini14 mags and have a stripper clip guide slot in the receiver. The clip slot was one of Col. Cooper’s defining characteristics for a scout rifle. You can claim that the concept has evolved to favor swapping in a fresh, loaded mag, but the expensive proprietary mag hurts that claim. AR15 mags would be best, I could see Ruger using the Mini14 mag, but the shimmed 308 mag is just plain silly. Jeff Cooper suggested Scout rifles should be charger loading capable from memory. Why use a proprietary magazine? Stupid idea. I might be wrong but ain’t AI magazines available in 223 as well? That would make perfect sense as to why ruger sticks with this type of mags then. Great in every way except that horrible trigger, why not make it adjustable, this way you can ad an instant hundred bucks to making it shootable, but once done as I have had to, they are very accurate and handy as heck.